Join Stephanie Herman, former Principal Ballerina, currently a performer, entrepreneur, and developer of an innovative way to apply Pilates to all types of movement. Stephanie will share the secrets of her ballerina career, and reveal the makings of "Ballerina, A One Woman Play." This piece tells the story of the birth of Stephanie's career, while weaving in behind the scenes stories of dedication, perseverance, and triumph. Enjoy a video screening of "Ballerina: A One Woman Play", in which the story is told through dance, music, film, and narrative. Join Stephanie for a Q&A session! ?Tickets can only be purchased online prior to the show. Based on the inspiring true story of Stephanie Herman, a Balanchine ballerina who perseveres through rejection and injury to rise to the top of the ballet world during the 1960’s and 70’s. 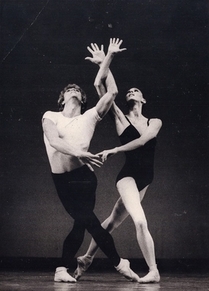 She performed on world stages, toe-to- toe with twentieth century dance legends –Mikhail Baryshnikov, and Rudolf Nureyev, and worked with icons such as: George Balanchine, Alvin Ailey, Martha Graham, But this is more than the story of a dancer’s ascent, despite adversity, and her eventual fall. Conversations with James Redford has just WON the WAVE Award, for best information talk show. The Stephanie Herman Show is award-winning television that is all about enhancing people's lives through Lifestyles, Entertainment, and People. The shows feature fashion, interesting travel venues, restaurants, musicians, artists, personalities, and more. Airing on both Public Access TV in the San Francisco Bay Area, and on Converge TV, nationally and globally, The Stephanie Herman Show has broad reach and appeal. Stephanie Herman interviews James Redford a heartfelt talented documentary producer whose films are educating viewers about hidden truths. Some of the documentaries we will be talking about will be: "Toxic Shock" about flame retardants that are carcinogenic, and The Big Picture - Rethinking Dyslexia. James Redford is Founder and President of The James Redford Institute for Transplant Awareness (JRI), a nonprofit organization dedicated to educating the public about the need for organ and tissue donation through film, educational outreach and the web. James founded the organization in 1995, two years after receiving a liver transplant at the University of Nebraska Medical Center.